Today I played with the "The Wilderness Awaits" set. I love to color but when it comes to coloring animals I often have trouble. I colored the deer in using Tip Top Taupe ink and a blender pen. I added a little Delightful Dijon on top of the Tip Top Taupe. I'm not thrilled with it but it will do. The rock was colored in using Smoky Slate. And I sponged the edges using Tip Top Taupe. The words are from the "Wetlands" set. And I added a piece of Delightful Dijon decorative paper to the wood textured Crumb Cake background. It was a simple card to make other than the trouble with the coloring. I have some fun news to share with you! In July I was asked if I would be interested in being on the Design Team for Skipping Stones Designs. I have been asked in the past by other companies and have turned them down due to lack of time but this time I looked at what I had going on in my life and realized I could work making some cards and projects into my life! Stop back tomorrow for the blog hop and your chance to win a great prize from Skipping Stones Designs. And you can see the card I made using the Skipping Stones Designs. Oh and me and my fellow team members are called Stamp Tramps!!! LOL!!! See you tomorrow for all the fun! It's been a few days since I've posted a masculine card. It is my hopes in August to post a few more masculine cards per week than I usually do. It's difficult to find masculine card samples. I suppose that has something to do with the small amount of masculine sets out there!!! It makes sense!! Okay, onto this fun card. Peggy at Stamping with Peggy had a card posted and I liked the splatter on the top and the stripes on the bottom. I changed the location of the car and I added the words. I also added more layers and in a different color too. Hers is in Basic Gray. I like her sample too! I did mine in Early Espresso. I also use the Tip Top Taupe ink and card stock because the decorative paper from the "Cherry on Top" 6" x 6" stack. I flipped through the stack looking for something masculine and I was thrilled when I saw the stripes and even more thrilled that they were in a "masculine" color!!! So I was able to make this card using some ideas from Peggy's card and then adding a bit more to it! I was inspired by the colors of the "You've Got This" card I found by Carolina at Studio Evans. I LOVED the colors she used. The new Mint Macaron and Tip Top Taupe were used here. This was such an easy card to make. The background was stamped off once. The flower, stem and leaves were colored in using a blender pen. The words are from the "Wetlands" set. I layered it with Mint Macaron. I set the words in place using Dimensionals. I liked making this card and I think it would be fun to make a set of these as a gift!! Several posts ago I made a masculine card using the black and white decorative paper and the black card stock. Since I had cut the paper on the diagonal, I was able to make another card front with it. I put it together and set it aside. You can see that masculine card here. While looking for something else on my worktable I ran across this card front and wondered what to do with it. I found a butterfly. It was in Pacific Point. I didn't want that color so I cut one out of Basic Black. Then I sat for a bit wondering what to do with it. I rarely use the paper doilies and I thought that would be pretty. It would keep with the black and white theme I had begun! The words are from the "Teeny Tiny Wishes" set. I affixed the butterfly using pieces of Dimensionals. I added some pearls down the center of the butterfly, still keeping with the black and white theme I had going on. I like the way this card turned out. It was fun to make and it was very quick because there wasn't a whole lot to do to make it!! I have a friend that I was thinking about off and on all day today so I thought I would make a card and get it off in the mail to her tomorrow. I used the "Garden in Bloom" set to make this card. The base of my card is Basic Black. The next layer is Pear Pizzazz and then Whisper White on top. I stamped the flowers and cut them out. I used Daffodil Delight, Melon Mambo, and Pumpkin Pie inks on the flowers. I had to fussy cut them out, there are no dies or punches for these flowers. I also stamped and fussy cut the leaves too. I scrunched them together and liked the way they landed so I taped them together on the backside. Then I used double sided tape on the back to set them in place on the card. But before I set them in place I cut a 1" x 3-1/2" piece of decorative paper. I added a little strip of Pear Pizzazz on top of the decorative paper. I am thinking now that I should have used Basic Black for that little strip. The words are from the "Garden in Bloom" set. It's always fun when there's words in the set that fit what you want to say without having to find another set to use. Though I don't mind combining sets (when I'm not feeling too lazy to get up and find one!!! LOL). I have used this set a few times and am looking forward to using it again. It's got SO many possibilities!!! I'm not sure but I think this may fall under the category of a "thinking of you" card. This is one of my favorite layouts. Later in this post I'll give you the dimensions of each layer and how to do that center so that both layers are centered. It's a lot easier than it looks!!! I like to use this layout when I have small images to become my focal point. Here I used the little duck to make my patterned piece. I colored it in using Daffodil Delight and Pumpkin Pie markers. I cut that piece 2-7/8" x 3-7/8". The Basic Black layer behind it was cut 3" x 4". The Whisper White layer behind that was cut 3-1/2" x 4-5/8". I don't normally add the next layer but the card looked too washed out without it. I cut it 3-5/8" x 4-3/4". And the base of the card is a piece of Daffodil Delight cut on the short side at 4-1/4". I folded it at 5-1/2". Next I stamped the larger duck and colored it in using the same colors as the little duck. That piece was just scrap but it needs to measure at least 2" x 2". For that front panel "trick", you will need to put a little bit of removable tape on the upper center of the card. I try to put it at the point that I think the circle will be punched from. Make sure you line the edges of those two pieces up. You want it to look like it's a finished piece. Once you get it lined up, take your 1-1/4" circle punch and place the piece inside. Drop it down until it hits the bottom of the punch. Look at each side of the punch to make sure they look even. Punch out the circle. Next take the 1-3/8" circle punch and punch the decorated piece again. Make sure you line it up so it looks like it's even or close to even all the way around. It's a little difficult to see because you're not punching off much. If you are using decorative paper instead of card stock on this piece, you will want to put a piece of scrap copier paper behind it or the circle will rip as you try to punch it. That paper is too thin to use this trick on! Now to assemble the card. Tape the top 2 layers together, lining up the circles and edges. Add Dimensionals around the circle on the backside. Center your image on the 2" x 2" piece and set it in place. Add Dimensionals around the rest of that piece and set it aside. Take the next layer or two if you needed to add that extra layer and tape them together. Then tape them to the front of the card. Now tape the focal layer to the front of the card. And finally, I added some words. You can tie a ribbon around the front and add a bow but you need to do this before you tape it to the front. I had fun making this card. Once again, I was in the coloring mood!!! Plus these little ducks are so darn cute!! Thank you SO much for stopping by today, and I hope your day is just ducky too! To make this "You've Got This" birthday card I stamped the flower using the Versa Mark pad and white embossing powder. I colored in the flower using Daffodil Delight, Calypso Coral, and Wild Wasabi markers and a blender pen. I colored in the whole flower first and then I came back with another layer of color. You can do this up to three times before the card stock begins to slough. Sometimes you can get by with it if you aren't too aggressive with the pen. You do need to remember to pat the flower down after each coloring. The ink beads up on the embossing powdered lines. The words are from my computer and set in place using a layer of Calypso Coral and a scalloped circle using Wild Wasabi. This piece was set in place using Dimensionals. This was a fun card to make and I LOVE coloring!!! I like to keep my blender pen very wet so the color goes on smoother. Click here to learn how to take your pen apart. There you will find a link to the recipe to refill it. If the tip of your pen is wore down to the point to where it's soft and you can no longer do details, you may want to just skip the refill and get a new pen. Or you could refill it and use it in large areas. Labels: ~Stampin Up Products Entirely Used Here, ~Stampin Up Products Used Here, 20 Minute Cards, Birthday Cards, Rubber Stamping, Stampin' Up! While surfing the net I ran across a card that I had to copy the elements I liked the most. 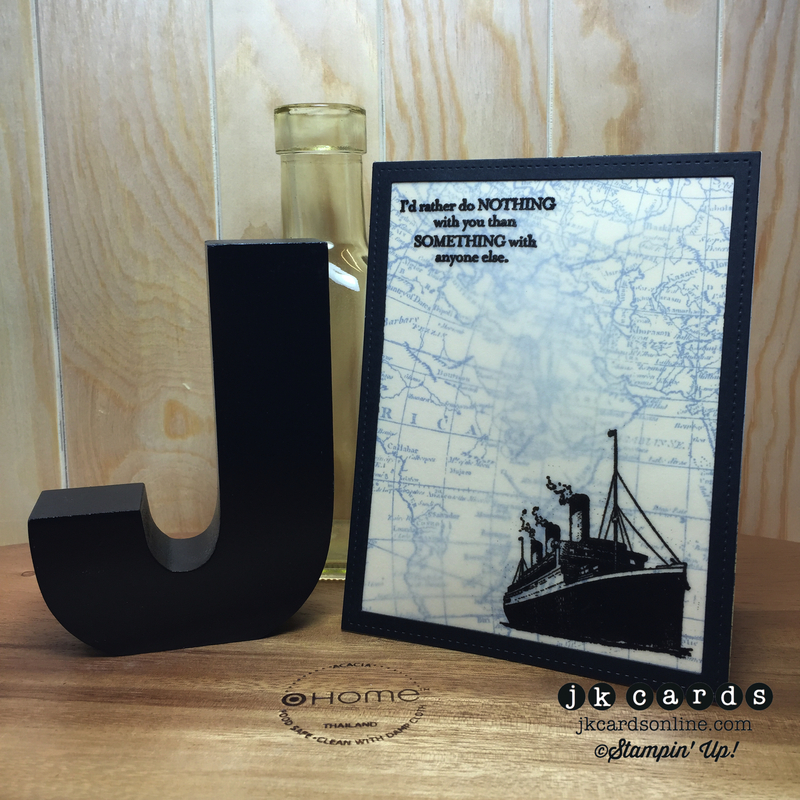 I found this card made by Justin at JKCards. I liked the map with the vellum on top. I don't play with vellum much so maybe that is why this card intrigued me. I like the World Map background stamp. The ship is stamped on the vellum using black StazOn. The words are from the "Wetlands" set and I punched them out with the oval punch. I added an oval scallop in Pacific Point for the layer. I also layered the the map in Pacific Point. Oh and the map was stamped using Pacific Point ink. This is a very quick and easy card to make. I am thinking I want to play with vellum more!!! I am really liking this "You've Got This" stamp set and I think I'm going to have to order it. Once again I did some fussy cutting here. I don't like to fussy cut but sometimes you just have to and there are actually times I'm in the mood for it too!!! Today I was in the mood to color and in the mood to cut!!! I used a blender pen and Pink Pirouette, Daffodil Delight, and Wild Wasabi ink pads. The background was done using the White Craft ink. I REALLY like this background stamp. It comes with the set!!! You can use this background on other stamp sets. Another reason I want to get this set. The words were done on my computer. I set the flower and the words in place using Dimensionals. It doesn't get much simpler than this!!! I love the look of this flower. This is another set that I borrowed and I do believe I'm going to have to buy. This set has a wonderful background stamp that comes with it and I just HAVE to have it!!! There is the new "Watercolor Wash" background stamp that I tried out but I was not as thrilled with it as I was the background that comes with this set. I will make a card using it in a few days and show you, or you can look it up on the net by Googling the "You've Got This" set by Stampin' Up!. I always add the company name, then Google can sort through the images easier and find me exactly what I want. Be sure to click on "Images". First there's "Web", then "Images", and so on. Then you get to see lots of photos of cards and projects made. If you click on an image, it will single it out and enlarge it. Then to the right of that you can "visit" the page and you will be taken to the creator of that particular item. As simple as that!!! Okay, enough about that. Let's talk about this card. I used Watermelon Wonder for the base of the card. Then I added a layer of Basic Black, and on top of that I added the focal piece. I colored in the flower and stem using a blender pen and the ink pad. The words are from the "Wetlands" set. And the are behind the words was done using a stamp from the "Perpetual Birthday Calendar" set. I stamped off once. The image was way too dark to just ink and stamp directly. I tied a ribbon around the edge before I attached the focal piece to the Basic Black card stock piece. This was a very fun card to make. I was SO in the mood to color!!! Today's card was copied from a card that Carol from Carol Payne Stamps made. I tried to find it on her blog but was unsuccessful. I copied it pretty close. I did add texture to the Crumb Cake card stock and I did add a layer of Early Espresso to the left panel with the cars and map stamped on it. I'm not sure how Carol did the background on the panel. I think she had some card stock with a grid on it. But I thought the World Map background stamp would work just fine. It has to do with travel, so it keeps with the theme!! The base of the card is Marina Mist. It was cut on the short side and folded in half. The Crumb Cake layer was added. Then the panel. The circle around the car was cut using the Circle Framelits. The Early Espresso layer behind it was punched using the 2-1/2" circle punch. The words come with this set. I stamped them and then punched them out using the "Banner Triple" punch. I can't even begin to tell you how fun that punch is. You cut your card stock 1", 1-1/2" or 2" and you can make 3 different width banners. It's great for layering them too!! I don't have one (yet). I used a friends punch to make this card. I used her stamp set too. I have that set on my wishlist too. It's a wonderful masculine set. It's filled with images plus words. Even words for brother, uncle, son, dad, father and grandpa. It's a very impressive set!!! I played with it for a while when I had it and I'll be showing other cards using it, once I get them assembled! This was a fun card to make. It went together really quick too! Today I'm going to share with you a very versatile card. This card can be used for quite a number of occasions. From retirement to birthdays! Add Father's Day in there, Get Well, Thank You, Thinking of You. It can be for a brother, husband, uncle, friend and yes, even dad!!! With this card layout you can make one card for now and save one for later. Or you can make two right away if you need them. I only needed one card so I have the other waiting for whatever pops into this busy brain!!! I put my decorative paper on top of the Basic Black card stock and I cut both layers at one time. I did it that way because I wanted them to both be even and have the same cut. I did put the other two halves together but I set them aside for another day. I like this layout because it's not only easy, but it's also quick and pleasing to the eye!! Had there not been words under the shoes, I may have stamped something in the bottom left corner and embossed it in white. It's a little difficult to see here but the shoes have a Basic Black layer around them. That piece was set in place using Dimensionals. I thought I would play with the Camouflage Technique a little bit today. You can find that technique here. I thought it was odd that so much red came out of my Soft Suede ink pad. But it's okay, I still like the looks of it. If I really wanted, I could have scrunched it up one more time and dragged some Early Espresso over the whole thing. I colored in the duck using Pear Pizzazz, So Saffron, and Pumpkin Pie markers. Plus I added a little Soft Suede to the bottom of the marsh to kind of hide the white area it created. This was a super fun and easy card to make. Plus it makes a great masculine card!!! Today I'm going to share with you the stamping technique that Terri had at her last Technique Night for her downline. Mary taught this fun technique. This is a very easy and fun technique to do. I just put my card together last night. I had it for a couple of weeks but didn't get back to assembling it. We took a piece of Very Vanilla card stock and covered it with Sahara Sand ink. You can use Crumb Cake ink instead of the Sahara Sand. Then we scrunched up the card stock. Next we opened up the card stock again and ran the Old Olive ink pad over it. You want the Old Olive to hit the high parts on the card. You don't want to completely cover it. Next we sprayed the card stock with rubbing alcohol. We scrunched it up again, opened it up and then ran the Always Artichoke ink pad over it. Try not to cover up too much of the Old Olive. Then we scrunched it up again and opened it up to add Soft Suede over it. You want to make sure that you don't cover over all of your previous colors. Scrunching it after each color addition helps to create new peaks on the card stock for the next ink color to get on it. The last thing we did was sprayed it with rubbing alcohol and turned it over so the ink side is down and we used the bone folder to smooth out the card stock. Once it was dried we used it on the background of our card sample. This is a very fun and simple technique. I have plans on participating in the next swap and this is going to be the technique I use! And of course, I will share my creation with you!! This is one of the fun and fabulous cards I made at Terri's Stamp a Stack. This was the last of the 5 different cards we made. I saved the very best for last. Though it was hard top pick which order to put them in because all of her cards are fabulous! To make this card you need a half sheet of Whisper White cardstock and fold it in half on the long side. You will need a piece of Smoky Slate cardstock cut 4" x 5-1/4". A scrap piece of the Neutrals Color Collection Smoky Slate color. We also used a Ta Lace Paper Doily, WHite 1-1/4" Jute Ribbon, and a Rhinestone Jewel. You will need the Sweetheart punch to punch out the hearts. And the four petal flower from the Itty Bitty Accents punch. This was a very fun card to make and in person it's SO pretty! Terri is SO talented. I'm looking forward to her next Stamp a Stack in August. You can also add some verbiage to the card. I used the "Teeny Tiny Wishes" set and made two anniversary cards and one wedding card for future use. Aren't these cute? I used the "Garden in Bloom" stamp set to make them. Plus I used the newest "In Colors". These little notebooks measure 2-1/2" x 2-1/2". I have a Rubi Coil machine that punches the holes 4:1, which means there's 4 holes per inch. I have lots of coils at home so when I was shopping for a machine, I had to make sure I got the one with the right pitch or all of those coils would be worthless. I often save my copier paper that was only printed on part of it. As long as there's 2-1/2" left, I cut it up and set it aside for notebooks. It's fun to make these little notebooks. I often sell them at the craft fairs. People LOVE buying stocking stuffers. The colors I used here are Watermelon Wonder, Mint Macaron, and Delightful Dijon. On the Watermelon Wonder I also used Calypso Coral behind the butterfly. On the Mint Macaron one I used Smoky Slate. And on the Delightful Dijon I used Hello Honey. I went to the Color Lab and entered in one of the new In Colors and had the site find a color that would compliment it. I got lazy and didn't want to rifle through the card stock to see what would match. This is a free site to use to coordinate your colors. I had not used the site in a while, mostly because I can usually figure out the colors myself. Plus they had included in the list all the retired colors. Now there is a drop down menu for just the current colors or you can pick by color group, or all colors including retired. I like that site SO much better now that they separated the colors like that. I will probably use it more now. If you are not familiar with it, go to the link at the beginning of this paragraph and check it out. I think it will be come your new coordinating buddy!!! You can also see some cute snowman ones I did a few years back. I always sell out of them at the craft fairs. Click here to see the snowman notebooks. These make great Hostess Appreciation gifts, Customer Appreciation gifts and of course, stocking stuffers!! I use to sell the notebooks but that was before I had a million other things do to, but if you REALLY must have some, you can contact me. Look to the right sidebar and find the icon that reads "Got a Question". My email address is found there. This is the card I am bringing with to the stamping event today. Like I said yesterday, I didn't have the new current cat stamp set. But I did have this cute cat face stamp that my dear friend Katie gave me several years ago. She knows how much I LOVE cats. The stamp is by the Stampendous stamp company. I'm not sure where she got it, so I can't share that information with you. You may want to check the comments in the event she leaves one saying where she got it. I made a card like this a couple of weeks back. You can view it here along with the measurements. It's one of my favorite layouts to use when you have a small image. The words are from the Wetlands set. I stamped them using Black Memento ink and I punched them out with the oval punch. I punched out a scalloped oval using Smoky Slate card stock. The base of the card is Smoky Slate, the next layer is Whisper White, then a layer of Basic Black, and on top of that a piece of the Black and White dotted decorative paper from the "Pretty Petals" 6" x 6" stack. These cards are easy to make and fun to give!!! I am attending a stamping event tomorrow and I needed to make some wrapping paper to wrap a gift for a gal who LOVES cats. I did not buy the current cat set in the catalog so I had to improvise. Then I remembered that I still have the "C is for Cat" set. I took out my Smoky Slate ink and a piece of 32# copier paper and made my own paper. I didn't have any gray ribbon so I did the next best (and probably better) thing. I took some Smoky Slate card stock and my "Bow Builder" punch and made my own bow. I have found that if you use your bone folder to curl the large bow pieces plus the small rectangle piece, it's much easier to work with. I usually use a large clip (or a clothespin will work) to hold the pieces together after I glue them. Yes, I glue them. I feel that glue holds better. Tape has pulled apart and the Sticky Strip is a bit tricky to work with when you need smaller pieces. And I know the glue will hold, so I just go with the glue! You can use your stamps to make wrapping paper. I don't recommend using shiny paper, the ink doesn't seem to dry very well on it. It tends to slip so you image isn't crisp and clear. You could use the backside of the shiny paper. If you have some sitting around, dress it up and use it. You can also use card stock but it's pretty thick and doesn't fold well when wrapping the gift. I like 32# copier paper the best. I have used 28# and it works well too but the larger the number the thicker the paper and the less the box behind it shows through. Regular 20# copier paper would work but the container you are wrapping will often show through. I suppose you could wrap it with a piece of regular 20# copier paper and then stamp on another piece and wrap it up. That should cover the container better. So here is my gift for tomorrow! I don't think I can make enough flower cards. It seems like I make a bunch of them and suddenly fall is here. Fall flowers are pretty but not as bright and cheery as the spring and summer ones are. This flower is from the "Garden in Bloom" set. This is a very fun set because it's one of those 3 step stamping sets. 2 and 3 step stamping always gives the image a nice depth. I stamped my flower using Blackberry Bliss. I also stamped the words and dots using that ink. The dots are from the "Gorgeous Grunge" set and were stamped off once. The words are from the "Wetlands" set. The center of the flower was stamped using Hello Honey ink. The stem and leaves were stamped using Mossy Meadow ink. One of the nice things about the polymer stamp sets is not only that you can see through them for better placement but you can also bend them. I bent the stem as I was setting it in place on the stamping block. I did cut the flower out by hand. I'm not a big fan of fussy cutting but once in a while I do break down and do it!!! I layered the focal image using a trimmed piece of Blackberry Bliss. And those two layers were set in place on a folded half sheet of Whisper White card stock. And that was it! So simple! Isn't this Bohemian DSP pretty? I love these colors. I made this card at Terri's Stamp a Stack. Which also means that I don't have this paper. I got to use it on my card at the Stamp a Stack. It is now on my wishlist. The base of the card is Bermuda Bay. The decorative paper was taped in place and then the tag was punched using the "Scalloped Tag Topper" punch. The words were stamped on using Bermuda Bay ink and the Gold Metallic Bakers Twine was tied on before the piece was taped to the card. And that's it. Super easy, super cute, and super fun!! I don't play with this fun "Flower Patch" very much. I LOVE the whole concept of all of the dies that match the set. No more cutting. I don't know what it is but I would still rather use a punch than a die. I think it comes down to me being lazy. I would have to get up, go over to my work counter, put the die on the magnetic platform, sandwiched between the plates, and crank the machine. It doesn't sound like a lot of work or effort, and it really isn't. Plus I can cut two layers at a time if needed. I don't know why but I would still rather punch!!! Okay, let's talk about today's card. I used Pool Party, Bermuda Bay, Wild Wasabi, Pear Pizzazz, and Daffodil Delight ink. I set the flower in place using Dimensionals on each layer. The words are from the "Wetlands" set. And this card is very boring and blah looking. After I got it all put together I thought it should have a layer of Bermuda Bay behind it. Well, I tried to remove the flower but those Dimensionals stick SO well! I even thought of taking it over to the paper cutter but there isn't enough room between the edge of the flower and stem and the edge of the Whisper White cardstock. So this is what I have for today. Blah!!! 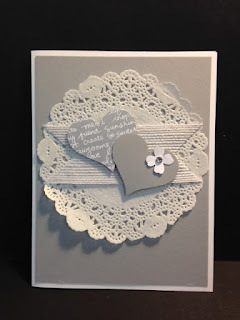 Here is a card that I made at Terri's Stamp a Stack back in June. I had put them in a bag and forgot about it. To make this card we used a quarter sheet of Wisteria Wonder cardstock. On top of that we put the piece of Whisper White that was cut at 4" x 5-1/4". The flower and the words were stamped on the side using Elegant Eggplant ink. The butterfly was done using the Butterfly Framelits and Elegant Eggplant card stock. It was set in place with a Dimensional on the Wisteria Wonder panel that measured 2-3/4" x 8-1/2" and was folded in half. This piece went around the card. The flap lifts up and that is where you can write your sentiments. A pearl was added to the butterfly to complete the card. This was a very fun card to make!!! Apparently this is one of my favorite layouts. Okay, not so much my favorite but one I use a lot. Though I do like it. It is a perfect layout for those types of images that are long. You can keep it simple or add a ribbon around the flower before you affix it to the textured piece. This is an easy layout to work with too. The base of my card is a folded half sheet of Whisper White card stock. Then a layer of Melon Mambo was cut. On top of that is a piece of textured Whisper White. The flower was stamped and a layer was added behind that. And the same with the words. Before I forget, the words are from the "Wetlands" set. I did glue the textured paper to the layer. I don't feel that the tape holds the textured papers in place very well, so I have always glued them. I also glued the flower layer on top of the textured paper. The rest of the card is taped together, and the word piece was set in place using Dimensionals. Such a quick and simple card!!! Give it a try. There's LOTS of colors that this would look pretty in too! I think this would also make a great get well card, a friendship card, a thank you card, a thinking of you card, and even a sympathy card. I have to admit, the tangelo Twist and Pear Pizzazz colors together just give me a happy feeling inside. I thought I would make a card using a simple flower. The flowers in the "Garden in Bloom" set have several fun flowers and leaves and other things to play with. I used the large flower. I like this stamp set because the stamps have little tabs to help you know which way is up so when you stamp the second part you can line them up easily. I stamped the flower using Tangelo Twist ink. Then I inked up the petals image and stamped off once. I stamped the petals on and this is how they turned out! I do with I would have colored in the center of the flower. The stamp set actually has a round image that I bet would fit perfectly in the center of the flower. Actually, I just checked the set and I think that image is a little larger for the flower center. I just took a pencil eraser and inked it up and tapped it in the center of the flower. If I had time I would take another photo but I'm in a rush here, sorry. The stem was stamped on and then the leaves. The leaves are also a two step stamping. I LOVE two step stamping! The words were done on my computer. I had printed out a bunch of them a while back and I have been using them as I needed. The words from the "Wetlands" set will work well there too. You just need to use the oval punch instead of round. This was a fun and simple card to make! Plus it's in such fun colors that I like together! 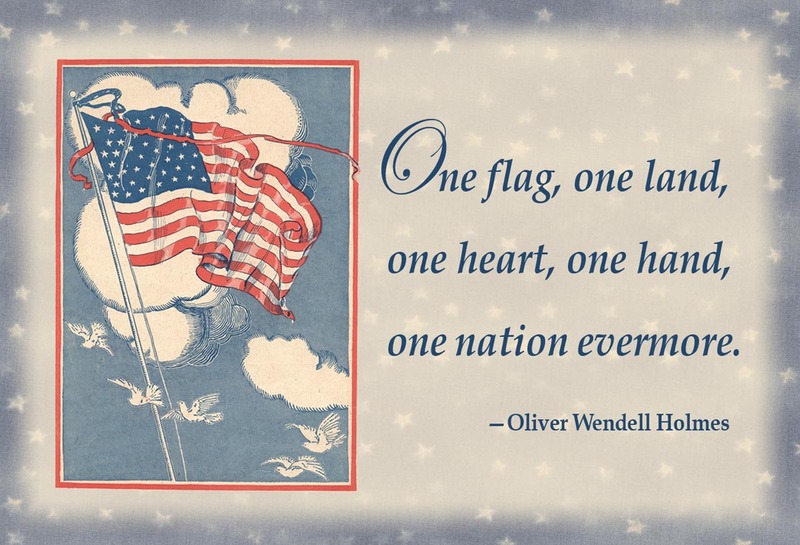 Happy 4th of July to you all. I don't have a patriotic card or project to share with you. But I do wish you a fun and safe holiday. Today I have a card I made using the "Wild about Flowers" and "Wetlands" sets. I used Old Olive for the base of my card. I added a layer of Whisper White on top of that. I do wish I would have textured the white piece now that I am looking at it on the screen. The center strip is a piece of decorative paper from the Bright's pack. The next panel is a piece of Daffodil Delight and I stamped the stem image using Daffodil Delight ink. The words are from the "Wetlands" set and I stamped them using Old Olive. All the panels are layered using Old Olive card stock. I was in the mood for a bright and cheery card! I was surprised at how quickly this card went together, even with all of those layers!!! Here's a fun and quick card to make. You can even make this into a thinking of you or a get well card too! To make this card I took Pool Party ink and stamped the dotted image from the "Gorgeous Grunge" set. Then I used a piece of the "Cherry on Top" Washi tape. I cut out the butterfly using Bermuda Bay card stock. I added some pearls down the center. The butterfly was set in place using Dimensionals. I stamped the words using Bermuda Bay ink. And then I just layered the card. I told you it was quick. Oh and simple too!! This is one of my favorite layouts. I like it because it allows me to use the smaller images in stamp sets as the focal point. The bee is from the "Garden in Bloom" set. The "HAPPY" is from the "Crazy about You" set. These cards go together quickly too. First I cut a piece of Daffodil Delight on the short side. This card opens from the bottom. I suppose it could open any way you'd like it to but I've always had my fold on the top. Next I cut a piece of Whisper White card stock 3-1/2" x 4-5/8". I cut a piece of Hello Honey card stock 3: x 4-1/8" and then I cut a piece of decorative paper 2-7/8" x 4". I used removable tape and added a little to the decorative paper and the Hello Honey piece. I then took the 1-1/4" circle punch and dropped the two pieces taped together to the bottom of the punch, centering it on the sides and punched out a circle. I removed the decorative paper and I put a piece of scrap copier paper behind it. I then took the 1-3/8" circle punch and lined up the decorative paper piece to trim that circle just a little bigger. Doing it this way you get the circles even every time. I then taped the decorative paper to the Hello Honey paper using permanent tape. I taped a piece of ribbon around the front of the card. You can tie a piece all the way around but there's no point to it, no one will see it. Once it's taped then you can slip a piece of ribbon on the front and tie a knot. I like using this method because I can slide the knot and always have it perfectly centered. Next I stamped the bee on a 2-1/2" x 2-1/2" piece of Whisper White card stock. I set it in place over the circle using Dimensionals. I added more Dimensionals around the card to affix it to the larger Whisper White piece. I also used some double sided tape on the back of the bee, it just needed something stick in that large are!!! Then I taped the large white piece to the Daffodil Delight piece. See, I told you it was simple! Today I thought I would play with the Split Coast Stampers Sketch Challenge #547. I have not played with their sketches in quite a while. I don't know why. I use to do them once a week. They release them on Wednesdays. Actually it's released late on Tuesday night. I would be up anyway, so I would play along and post my version on their site. I may post this one there just to let them know I played along! I used the "Wild about Flowers" and the "Wetlands" sets to make this card. The words came from the "Wetlands" set. I used Pacific Point for the base of my card and for the layers. The decorative paper came from the "Pretty Petals" paper stack. I just LOVE those little stacks! This stack had lots of very fun designs in it and I plan to use a lot of them in the upcoming weeks! Designer paper also helps to make a quicker card too! This was a fun sketch to play with it. Give it a try if you have time. I provided a link to the sketch above.